For a man who claims most action films are “misogynistic, rightwing and fairly vile” and and cites the Jason Bourne series of films as an inspiration, I was not expecting much from Hanna. Surprise surprise, it’s not a perfect action film, but it’s one of the few new action films this year that I would happily recommend. Hanna for the most part is a revenge film, and we’ve had several similar female-fronted revenge films in the past years that have names as their title: Leon, Kill Bill and Nikita, so it follows suit. What keeps this film interesting is that the plot has a gripping mysterious flair which I will not try and spoil too much. The character of Hanna (Saoirse Ronan) is a teenage assassin being trained by Erik (Eric Bana…so I assume he is playing himself) raised in remote location in Finland who has spent her life preparing for a single mission. As soon as Hanna feels ready to tackle this mission, she pushes a button in her home activating GPS system which allows the CIA to know where Erik and her are. Hanna is taken in from the CIA where a high up agent named Marissa (Cate Blanchett) takes a strong interest in her. Hanna manages to escape the CIA interrogation and seeks out her father while being pursued by Marissa. 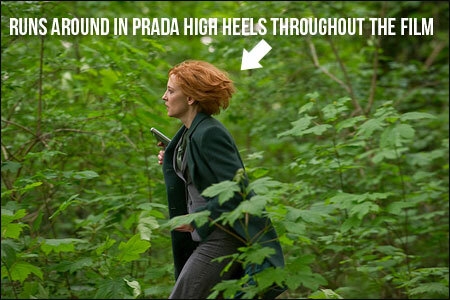 People who work in the CIA are notably trained to run in all forms of footwear. What grabs my interest throughout the whole film is that Hanna’s training and mission are left ambiguous for a large portion of the film. As soon as Hanna manages to escape to Morocco, the chase plot retains a good level of intensity as it remains increasingly uneasy to see if we should be rooting for Erik or Marissa getting a hold of Hanna first. Not to mention that if they get close to her, will they even be able to handle her as Hanna manages to be ahead of the competition at every turn. The film is predominately a thriller, but it has several strong action sequences. Scenes involving Hanna escaping the CIA compound, Erik escaping the clutches of the CIA in a train station, and Hanna’s location based fights (such as a train yard and amusement park) are all dynamite film-making. It’s good too see a film not skimp on such scenes while other films like Iron Man 2 and Thor have about one or two action scenes throughout. These action scenes were choreographed by Jeff Imada who also did the action scenes in The Bourne films. Thankfully, we are free of excessive shakey-cam here, so you get to wince at every punch to the face and bullet to the chest without getting a headache. Actually, you still might get a headache. Hanna is scored by The Chemical Brothers who’s music seems to still be stuck in the big beat era of the late 90s. We get rave sirens blaring and dumb guitar tracks kicking in throughout the action scenes that make me wish we Hanna had a more traditional score. We aren’t assaulted with the duo’s hit songs like “Block Rockin’ Beats” so we are at least getting new music instead of a music video advertisement for the group. My only other problem with Hanna is that the relationship that Hanna develops with Sophie (Jessica Barden) does not come off as entirely convincing. Hanna may want friends, but I don’t find that there is much chemistry between these characters. I’m not sure if this is because Hanna is purposely robotic throughout the film but having her bond with almost anyone seems unlikely. I don’t think it’s the script fault as it manages not keep up the pace with all the best things in the film. 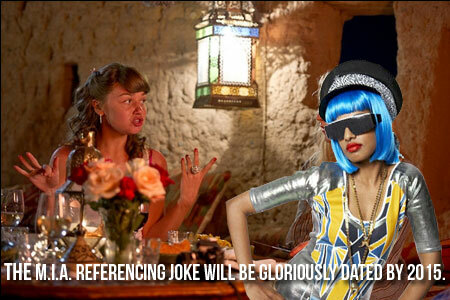 Everyone will be confused by the M.I.A. reference in Hanna in time. Despite two annoyances, Hanna is easy to recommend as a slightly Euro-flavored action film. All the actors are strong (Cate Blanchett is particularly strong as a hiss-able CIA member), the action works, and the script is quite good and does not insult your intelligence. I can easily see Hanna creeping into my list of the top action films of the year.